Steve Kilbey is Australian contemporary music royalty. A prolific artist who has written, performed and produced 21 solo albums, as well as 30 with rock legends The Church. His artistic oeuvre spans more than 45 years, and reaches outside the world of music, flowing in a cellular formation through his poetic lyrics into his psychedelic art paintings and far beyond. Steve has published 3 books (with a new one in the works), composed and written 750 songs, has conjured lyrics of biblical proportions, poured out plenteous poetry and imagined and realized hundreds of original paintings. 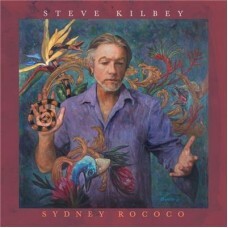 'Sydney Rococo' is a collection of Steve Kilbey songs written over the last 5 years. The songs sing of Sydney and her ocean pools, her underground seedy hangouts and treachery. The picture is painted in every song about life in this fast growing and evolving Australian city, famed for her beaches and landmarks. What's most tangible in the music is the lifestyle, habits and pastimes of those, that belong to a non mainstream world. Each song is a love song, but also a tale of woe and heartache. Typical Kilbey, making us fall in love and simultaneously feel the heartbreak of loss, betrayal and abandonment. Come and feel it within a song or 11 and get your own moves on with the infectious, pumping rhythmic melodies. This is SK's finest work to date. Fresh and modern, conceived with muses, it's ready to conquer the world.